Whether you want to say thanks someone via Twitter or Facebook or you’re sending a handwritten thank you card or note, thank you sayings are a handy way to share your gratitude. Here are thirteen awesome quotes along with some wording ideas on how to use them. You could write: Oprah Winfrey once said to “Be thankful for what you have; you’ll end up having more. If you concentrate on what you don’t have, you will never, ever have enough.” So I’ll say thank you for the money you gave me for my birthday, and keep thinking about how I can never gain enough weight from eating cake. 🙂 But seriously, thank you for your generous gift and coming to my party. It was a much happier birthday, because of you. Here are general sayings. You’ll find saying for specific occasions like birthdays, weddings, and more at the links. • Please accept our sincerest thanks. • You have my undying gratitude. • Your thoughtfulness knows no bounds. • My gratitude is endless. • My appreciation is ever-growing. 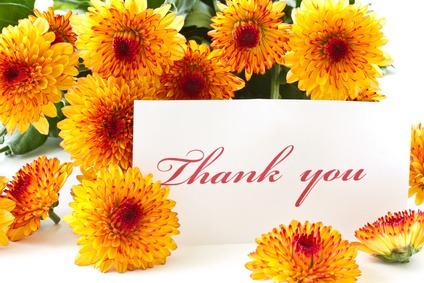 • You have our heartfelt thanks. • Your generosity has made me speechless. • Thank you so much. • Thank you from the bottom of my heart. • I cannot thank you enough. • You have my sincerest thanks. • Thank you ever so. • Thank you for the helping hand. • Thank you for everything. • Thank you for giving me the strength to go on. • Thank you for love that warms my heart. • Thank you God for our daily bread. • Thank you for all you have given us.